Best known as Shenshah Akbar in Mughal E Azam, Prithiviraj Kapoor is the patriarch of the Kapoor family of Hindi films, five generations of which, beginning with him, have played active role in Bollywood. He is also the founder of Prithvi Theatre. Prithviraj was born on November 3, 1906 at Samundri near the town of Lyallpur (now known as Faisalabad in Pakistan) to a middle-class family of Punjabi Khatri origin. He could speak Punjabi, Hindi and Hindko. His father, Dewan Basheswarnath Kapoor, was a sub-inspector of police. Prithviraj received his initial education at Khalsa College Lyallpur and at Lahore. His paternal grandfather, Dewan Keshavmal, was a powerful influence during his childhood. Baseshwarnath was posted at Peshawar, and so Prithviraj received his higher education at the Edwardes College, Peshawar, Pakistan and joined a one year programme in Law to become a Lawyer. It was here that his talents on stage first received expression. Prithviraj did his B.A. from Edward college, Peshawar, a feat that few of his descendants were destined to match. He also studied law as a graduate student for one year, but his heart was in the theatre. In 1928, with the help of a loan from his aunt, Prithviraj moved to the city of Bombay (present-day Mumbai). He acted as an extra in his first film role, though he grew up to get a lead role for his third Cinema Girl in 1929. After featuring in nine silent films, Kapoor did a supporting role in India’s first film talkie, Alam Ara (1931). His performance in Vidyapati (1937) was much appreciated. His best-known performance is perhaps as Alexander the Great in Sohrab Modi’s Sikandar (1941). He also joined the only English theatrical company called ‘J. Grant Anderson’ which remained in India for a year. Through all these years Prithviraj remained devoted to the theatre and performed on stage regularly, he developed a reputation as a fine actor on both stage and screen. Prithviraj invested in and founded Prithvi Theatre, a travelling troupe which staged memorable productions across India. In over 16 years of existence, the theater staged some 2,662 shows. Prithviraj starred as the lead actor in every single show. His other notable films are Mughal E Azam (1960), Harishchandra Taramati (1963), Sikandar-e-Azam (1965) and Kal Aaj Aur Kal (1971). In 1954, he was awarded the Sangeet Natak Akademi Fellowship, and in 1969, the Padma Bhushan by the government of India. He remained Nominated Rajya Sabha Member for eight years. This entry was posted on November 2, 2009 at 10:12 PM and is filed under the bad. You can follow any responses to this entry through the RSS 2.0 feed. You can leave a response, or trackback from your own site. Prithviraj Kapoor Remembering is very well thought,he was not only a great human but also great asset to bollywood. he did great films and created “R.K. STUDIOS” in chembur. 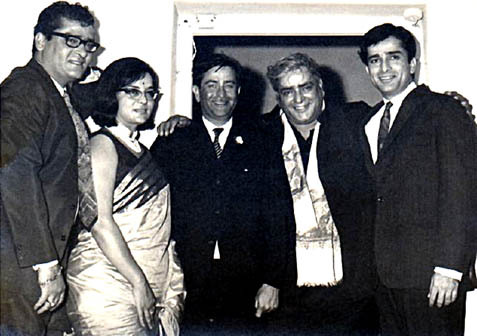 one of his great and presumable last film was kal aaj aur kal with his son raj kapoor and his grandson randhir kapoor. “A GREAT GUY” CHEERS MAN…….. The resemblance with Shashi Kapoor in the last photo above is marked. Thelast photo is from Sikander. If you see that film, he looks so much like Shashi there it is amazing. But a taller more imposing version of Shashi. Prithviraj for all his presence came across too theatrical, which worked some but not always.